As the Danish philosopher Søren Kierkegaard (1813-1855) observed, cultivating the habit of walking can lead to several beneficial outcomes. Walking can help stave off illnesses, inspire new thoughts, and resolve personal difficulties. Modern research studies continue to confirm what the 19th century philosopher knew from experience. We know now that in many cases this modest and inexpensive form of exercise can lower anxiety, improve the mood, make for better sleep, and reduce the risk of dementia. Let's add another important benefit of walking. In those places where we have remnants of an older pre-automobile pedestrian culture and where we're building new paths and plazas - that's our city, fellow New Yorkers - walking is still the best way to explore the landscape. Kierkegaard himself did not undertake walks just to get in better physical shape or develop a healthier frame of mind. He was checking out what was happening in his native Copenhagen. * Exercise can often seem like a drag, but not if it can be combined with a little old-fashioned socializing and sightseeing. 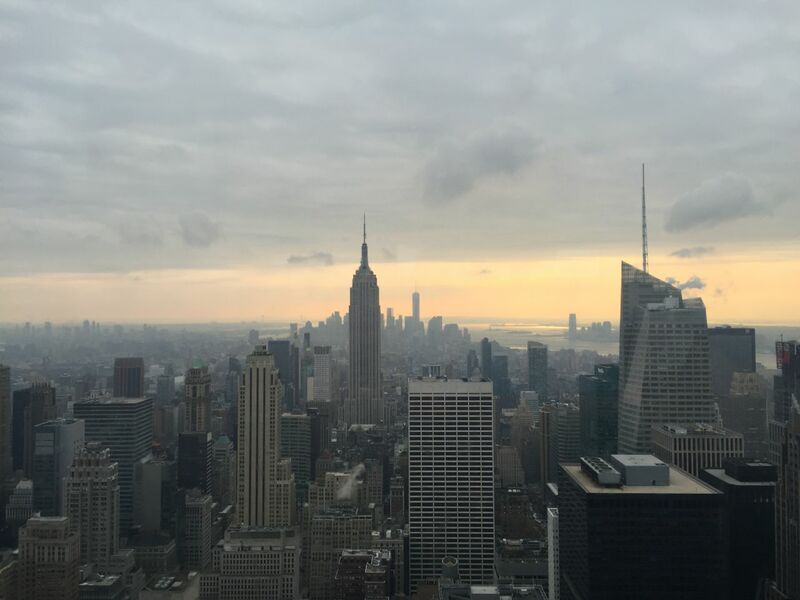 Instead of making a New Year's resolution to get in shape, why not make a resolution to see more of the city? Beyond the many opportunities to appreciate a picturesque urban scene or criticize an ugly development, exploring the city on foot allows us to witness changes in the society and engages us in the welfare of the community. 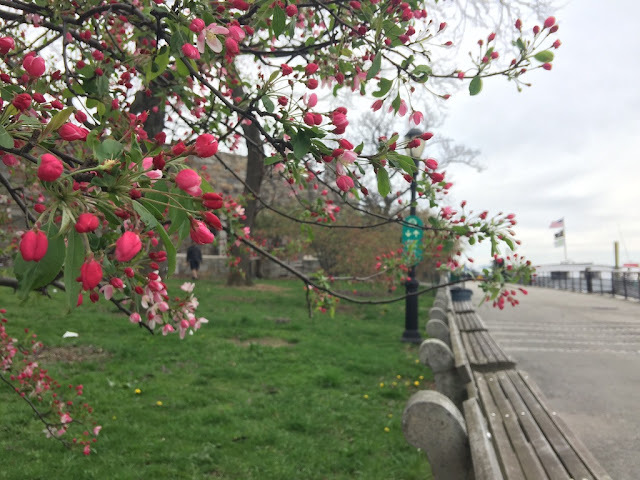 For those of us who appreciate what New York has to offer, the habit of walking invites us to return to familiar places but also the opportunity to travel outside the normal zones of comfort. Often, the familiar place turns out disappointing while the new place seems more exciting. • Lesson: This sounds counter-intuitive, but often I get in better shape when I use the subway. Why is this? "It's the stairs, stupid," I say to myself. Walking up and down a long flight of subway stairs, as most New Yorkers know, can involve a strenuous effort. Walking uptown in Manhattan on a flat terrain is easy, but walking the stairs in the 5th Avenue stop of the E train (the one across from MoMA), for example, when the escalator is broken, translates into serious unplanned exercise. • Activity: Living in northern climates makes this sort of commitment to physical exploration rather challenging. Flurries are in the air. The wind picks up, and the wind chill dips to near zero. We have options. 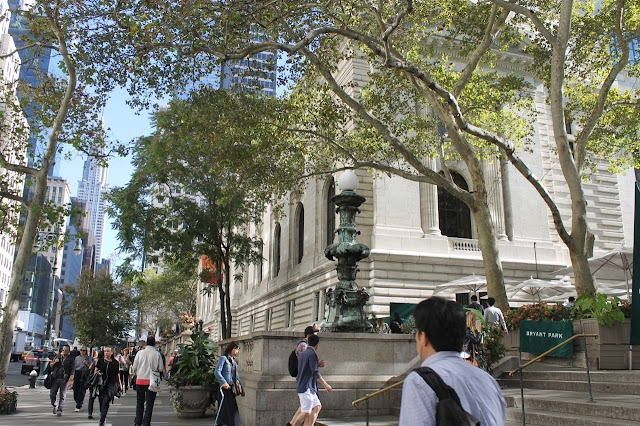 Explore the vast indoor areas of the Metropolitan Museum of Art, MoMA, the New York Public Library, the Brooklyn Museum, or Grand Central Terminal. Beside their stunning architecture, what else do these great NYC public institutions have in common? They all have awesome stairs. Let the spirit of adventure take charge. Sometimes, just getting out of the house or apartment and into fresh air may be enough to rekindle a curiosity about the world. The fitness goals will take care of themselves. Modest weight loss may ensue (I'm not promising anything), provided the walks are accompanied by some concerted effort to control pastry and/or beer consumption. • Lesson: Notice that Kierkegaard did not write, "Every day I walk off all the wonderful Danish pastry I consumed at breakfast." The sorry truth is that walking doesn't burn as many calories as cross-country skiing or running, so it's necessary to reassess a desire for "the Danish." To enjoy the health benefits of walking, pick up the pace and walk with some deliberation, as if rushing to meet a person for an appointment or to catch the next train. A person weighing 150 pounds walking a moderate pace of 2.5 mph on a flat urban sidewalk burns approximately 204 calories an hour. Smaller people tend to burn less calories, and big people burn more, but other factors must be considered such as age, shape, and overall body composition. We can use calculators to get a rough idea. A caramel frappuccino with skim milk has about 167 calories in it, so for a trim person of 125 pounds, it would take nearly an hour to walk that off. Using www.gmap-pedometer.com, I've calculated the necessary distance to walk off various New York favorite foods by connecting a walk between two New York sites or landmarks. • Little cheeseburger (550 cal) = Meatpacking District (near W. 13th St.) to Cathedral of St. John the Divine (W. 112th St.). Wow. That's far. • old fashioned cake donut (280 cal) = City Hall, over the Brooklyn Bridge, to Fort Greene Park in Brooklyn. • pastrami sandwich (1010 cal) = Battery Park to Audubon Terrace. In other words, the lower tip of Manhattan to W. 155th Street. • New York bakery cupcake (389 cal) = Brooklyn Bridge Park to the Brooklyn Public Library. Walking off a big apple is relatively easy. One apple measuring 3 1/4 in diameter has about 116 calories. A brisk walk of 3.5 mph should take care of that apple in about 30 minutes. 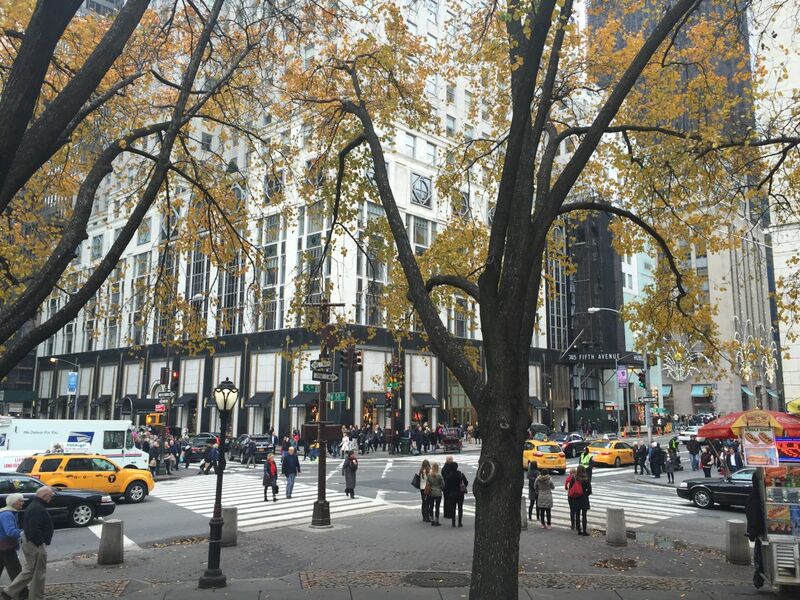 Activity: Find places in New York with gym-like features. 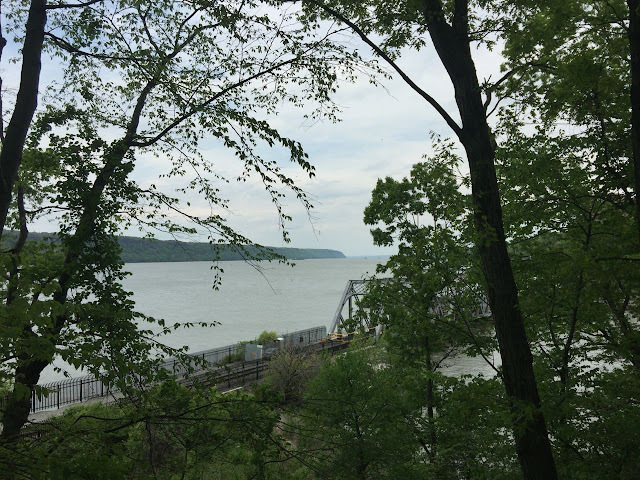 Fort Tryon Park is a good example, a pretty park with challenging terrain and one that includes The Cloisters, the Met's fine medieval branch. 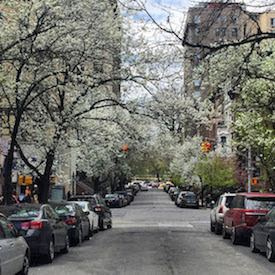 • If you're up in the Heights, get into step training via the step streets of Upper Manhattan. • What about forgetting punishing exercise for a minute and just deciding to stroll each day? Visit a new neighborhood, a place with a great view, or just a familiar place. It doesn't even need to be planned. • Lesson: Based on experience, a walk of around 2.5 miles is ideal, the kind of fast stroll that can be accomplished in 45 minutes to an hour, depending on the pace. Practice interval walking. The idea of interval walking - alternating high speed bursts with slower strolls - has been touted by many fitness experts as a way to rev up metabolism and burn calories. 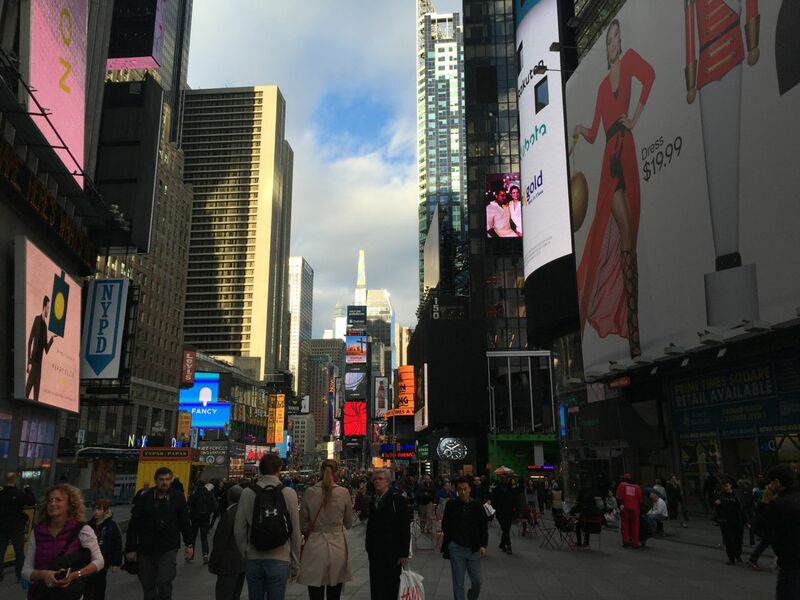 Walking fast for several blocks does help in warming up the cold winter body, and walking slow for a few blocks affords the occasion to look around and appreciate the scenes of the city. The good news is that almost all walking in New York is interval walking - running to beat the stop sign at the crosswalks, racing ahead to pass slow pedestrians, slowing down to look at store windows. • Activity: Instead of filling in a diet and exercise journal, make a travel journal with notes, drawings, and photographs of the walks. It will be much prettier than a journal showing repetitive numbers indicating you've reached a plateau. Imagine nice big printed-out photos of your walk on the Brooklyn Bridge or through a snowy Central Park. • Or, how about walking on the beach? First of all, walking on sand requires more work than strolling the flat boulevards of the city. 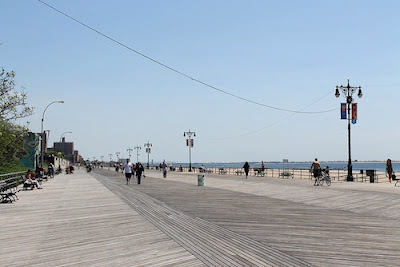 A jaunt down to the water at Coney Island quickly reveals a type of sand that is soft and deep, and you can feel muscles in your legs that you maybe haven't felt in a long time. In addition, the boardwalk is 2.5 miles long, an ideal length for a walk. With the cooling sea breezes and alternate views of seascapes and amusement park, Coney Island provides an ideal place for exercise in New York's hot summer. 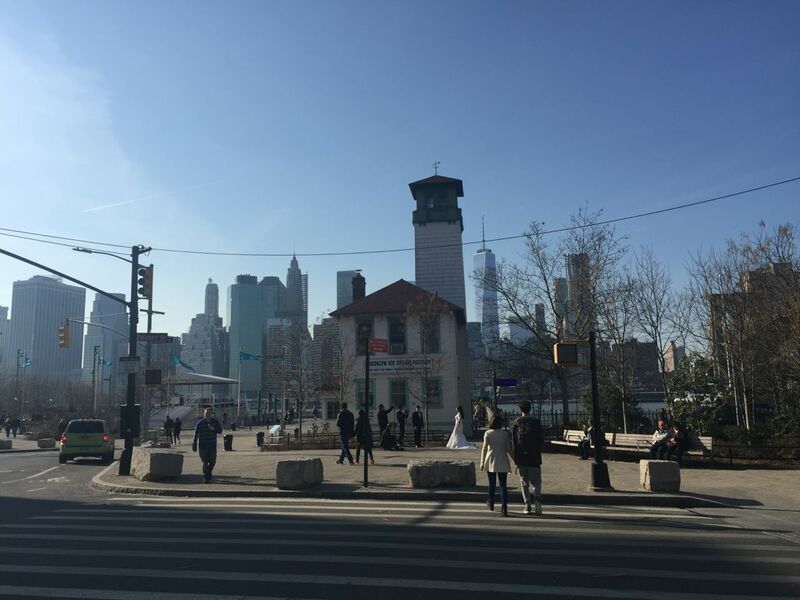 The fitness potential of Coney Island may be all the rationalization one needs for indulging in a few favorite food and beverage pleasures along the boardwalk and on nearby streets. • Trying to lose weight is really frustrating, especially if you've already lost weight. See Tara Parker-Pope's cover story, "The Fat Trap," in The New York Times Magazine (December 28, 2011). She writes of the body's transformation after weight loss, "How long this state lasts isn’t known, but preliminary research at Columbia suggests that for as many as six years after weight loss, the body continues to defend the old, higher weight by burning off far fewer calories than would be expected." • Conclusion: Experience the city through walking. The fitness goals will be accomplished, but the main goal would be to reconnect with the city as one of its most spirited citizens, to live life larger but without such large portions. * See "In the Tidy City of the World's Most Anxious Man" by Stephen Metcalf. The New York Times. April 1, 2007.